In Forcepoint Web Security deployments, Filtering Service forwards log information from Content Gateway to Log Server. 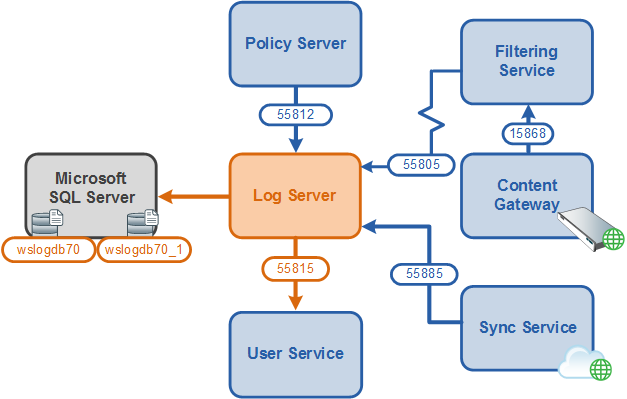 When a user generates browsing data for the first time, Log Server requests information about that user from User Service, which pulls the needed data from the directory server. From that point on, Log Server regularly requests user information for employee names, network login names and group membership, updating its stored data accordingly as changes are found in the directory. Custom categories and protocols, as well as changes to risk class mappings are forwarded to Log Server and maintained in the Log Database. When there is a problem with Log Server, none of this data is sent to the Log Database. Reports do not include the most recent browsing data, user information, or customized policy enforcement information. This collection contains the following articles to help you identify and resolve the underlying cause of reporting problems. Click a link to jump to an article, or use the arrows at the top of the content pane to browse through the articles in this collection.